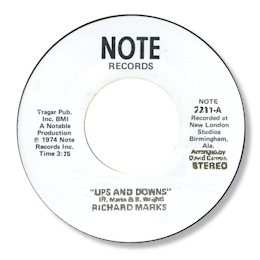 Funk fans love several of guitarist/vocalist Richard Marks’ 45s and indeed he did make some high class dance music – but there was more to his career than that. 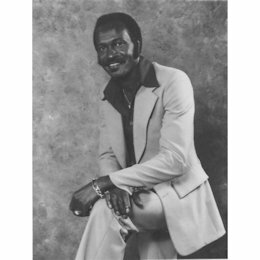 It seems as though his first release was the initial 45 for the legendary Tuska label from his home town Atlanta, GA. His own “Funky Four Corners” ran to two parts, with the second half being a fine advertisement for his guitar work. Although this got a national release on Roulette it never dented the charts. His second single “I’m The Man For You” is another spare funky workout, with more than a hint of the Soul Brother #1 in his axe style and horn arrangement. Georgia music man Tee Fletcher had more than hand in Marks’ upbeat “Don’t Take It Out On Me” which was leased out to Shout. The flip “Love Is Gone” is in a similar vein, but the better melody and higher grade performance from Marks make this the preferred side. His third Tuska 45 was for me his best to date. Did You Ever Lose Something was a fine piece of strutting southern soul with some fine horns, and the flip “Never Satisfied” was another JB styled funk winner. The odd ball release from his stay with Tuska was the Christmas 45. “Home For The Holidays” was a pleasant if unremarkable toe tapper, but the flip “Mr Santa Clause” was a revelation. A dead slow blues of considerable power it was the first time that Marks was able to show off his chops on a ballad. 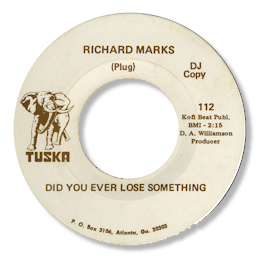 During the 70s Marks worked with Bill Wright for some time and they shared labels like Tuska and Note together. And it was Marks’ only single for the latter company that was the pinnacle of his career for me. Note 7211 is hideously rare – and it is a double sided winner, both sides being penned by Marks and Wright. Living My Life is a really fine tune, a standout southern soul opus of great power. Marks really gets into it, aided by a super horn section and some energetic girl background singers. The flip Ups And Downs though is even better - a real tour de force. This emotional deep soul ballad is much too good to be unknown – so I’m really pleased to be able to present it here. A tip of the hat to David Camon for the quality arrangments. The rarity of the Note 45 is almost matched by what I believe to be Marks’ final 45 – on Free Spirit. 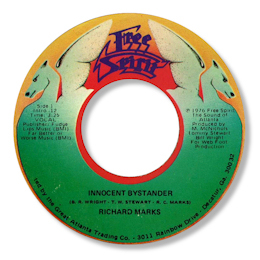 Innocent Bystander is another really strong song, a chugging rhythm driving it along, as Marks delivers a very well judged vocal. Bill Wright recorded his own vocal to the rhythm track, which came out a couple of years later on Midtown. Special thanks to my friend Yass for soundclips and an image, and to my friend Matt Starr for the suggestion. Grateful thanks also to Eothen Alapatt for sending the fine picture of Richard Marks - and to his family for providing the image. UPDATE ~ Eothen Alapatt has written with the exciting news that he is preparing to issue an anthology of Marks' recordings. You can find the announcement here.